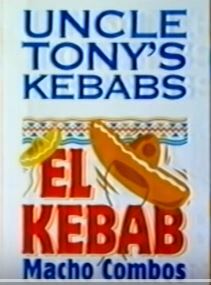 According to the company history of Uncle Tony’s Kebabs, the first kebabs were introduced in Sydney by Lebanese immigrant Tony Khater in 1965. His recipe was passed on to his nephew, Bill Mansour who, with his wife Rita, opened their Queensland business in 1983. Meanwhile, in 1979, Ali Baba had opened their first restaurant in Canberra. Ali Baba acquired Uncle Tony’s Kebabs in 2007. The history of kebabs in Australia is complicated. For a start, what do we call them? Are they kebabs, döner kebabs, souvlaki or gyros (pronounced ‘yeeros’ and, in South Australia, spelled yiros)? Or even shawarma? It depends on where you are and whether the purveyor of the bread-wrapped meat is of Greek, Turkish or Lebanese extraction. It also depends on whether the meat is carved from a stack of slices on a rotating spit (gyros, döner kebab, shawarma) or grilled on a skewer in chunks (souvlaki, shish kebab). Gyro, döner and sharwama all mean the same thing – turning. It just depends whether you’re speaking Greek, Turkish or Arabic. In Melbourne, said to be the third largest Greek city in the world, the souvlaki was the first widely available manifestation of the kebab. The Twins take-away, in Carlton’s Lygon Street, was perhaps the best known outlet, at least outside the Greek community. The precise date of its opening is difficult to uncover, but it was certainly operating by the mid-seventies. The Twins was mentioned in Helen Garner’s book Monkey Grip, published in 1977. A magnet for people with the late-night munchies for 30 years or more, it became the Intersection Café some years ago. Ali Baba, on the other hand, started in Canberra. Its founders were Lebanese. Brothers Mick and Karl Marjan first opened a restaurant in 1979, outside the Woden Plaza in Canberra’s inner south. This was followed by two more restaurants and, in 1989, take-away franchises. By 2012 the franchise had expanded to 43 outlets in eastern Australia. Ali Baba serves döner kebabs, shaved from a vertical spit. The Mansours, another Lebanese family who started Queensland’s Uncle Tony’s chain, did the same. And there are countless independent kebab shops, all with their own loyal or local following. In most parts of Australia the döner kebab or gyro is more familiar than the souvlaki. This method of roasting meat has its origins in Turkey, where the stack of meat was originally horizontal and turned over coals. The vertical version we see today was another Turkish invention and has been attributed to Hacı İskender, in 19th century Bursa. Although the take-away kebab is always some version of grilled meat and sauce, usually served in or on bread, there are many regional variations. Even within Australia, you’re more likely to find lamb in Melbourne and beef in other states. Chicken and falafel are ubiquitous. In Greece, the meat may well be pork. 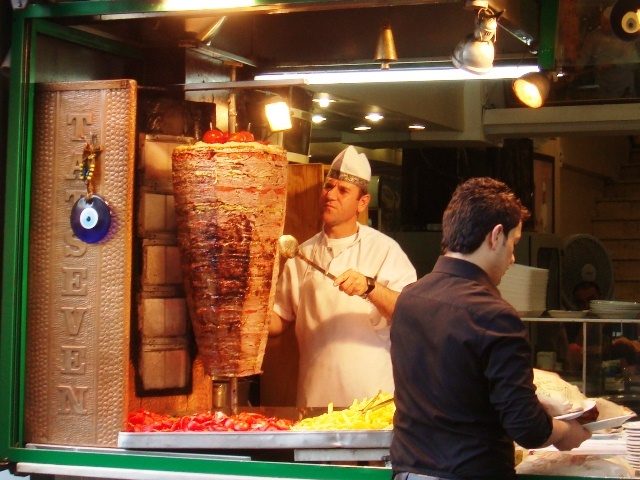 In Europe, the German-style döner kebab is renowned. It was invented and is generally produced by Turkish immigrants and is the street food of choice. German-style döner kebabs have now been introduced to America and the UK. In Mexico, Lebanese immigrants developed a version known as Tacos al Pastor. In Australia, the standard flat bread, meat, salad and your choice of sauce sauce version remains a popular anytime snack – either from the take-away counter in your local shopping mall or from a café or food truck to soak up some of the alcohol after a big night on the town.